Summer is coming to an end in our garden. I have a few squash for dinner this week and then they will be finished. The cucumber plants are dried up, but I have enough for a one more batch of Gazpacho soup. The red rhubarb swiss chard is trying to hang on until the cool weather come and then it will freshen up again. The last of the red, yellow and green bell peppers are getting a sun-burn everyday. And, the tomatoes are giving us one last crop. The garden is simple, and the veggies are for pickling and canning for the winter and for my favorite cold summer soup. Gazpacho is a popular cold soup in Spain. The Spanish include layers of toast or bread and that's one of the reasons I converted it into my version without the bread. The ripe tomatoes freshly picked from the garden make the centerpiece for this summer table. Layers of linens are put on to contrast the elements of the place setting. Green checked tablecloth has been around My Cozy Corner for a long....time. The white top is the center pattern of a duvet I sewed to use as a small topper for a night stand. The grapevine wreaths I bought at the DT. I love the Dollar Tree. My white plates are my basic go-to plates for the ruffled look of the edges. The green place mats and matching napkins were a gift long ago. The cute vegetable plates are from. Yes, you guessed it. Tuesday Morning. Clearance!!! The Flatware. Forks and spoons are from the GW at $4.00 dollars. When I got home and opened the container I discovered the knives were missing. I used my everyday steak knives to finish the setting. The green glassed are vintage...Just like me. I found them at a thrift store in the 90's to use for a Sunday brunch I was having for the family. The fresh bell peppers are from the garden. I picked them this morning. 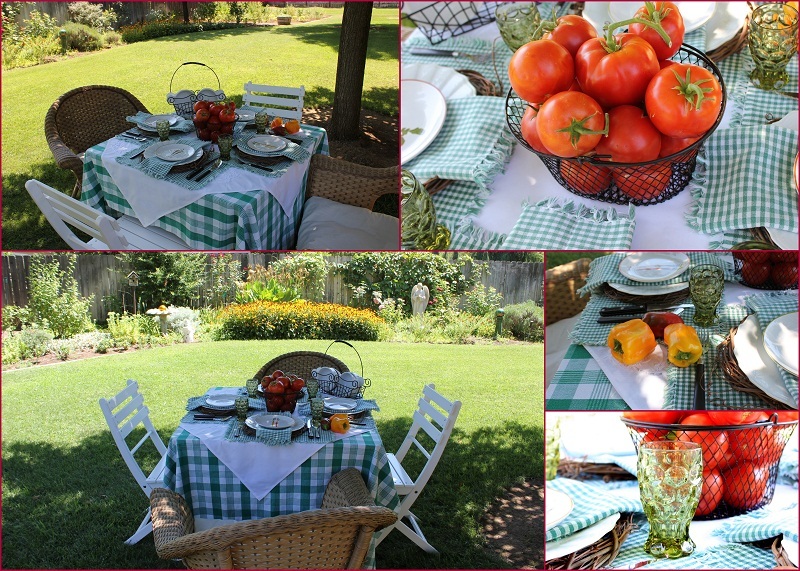 Fabulous Fresh Red Tomatoes give this table a refreshing country appeal. Oh My Gosh I love fresh tomatoes. and starting to crack from sun. I love fresh bell peppers. The red and yellow peppers are so flavorful and mild tasting . The white bowls I will use to serve the Gazpacho soup this afternoon. and put it on the counter as our go-to bowls. As always, I love to make a mosaic to capture the ambiance of the day. I bought a new container to store my soup in the refrigerator. The handle is great for getting the jar in and out of the fridge. I'm delighted you came to visit My Cozy Corner. I get so much excitement preparing these posts. 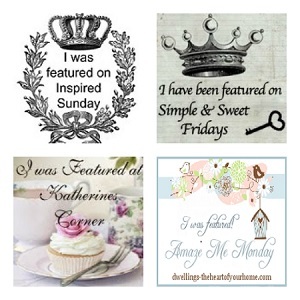 A big thank you to my new followers and all the wonderful bloggers who visit my blog. What a great lunch under the old pear tree! Love the plates from Tuesday Morning! Can't beat summer tomatoes. Is that gazpacho? Delish!!!!! lovely tablescapes. Dining under the trees is the most relaxing way to enjoy lunch. I love the twisted grape vines under those lovely plates. 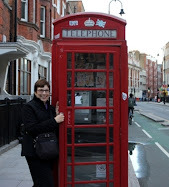 Linking up to you through Mosaic Monday. Have a wonderful week. Your delightful lunch in the dappled shadows of your old pear tree - pure perfection! And your fresh garden bounty, I practically drooled on my keyboard, yum yum!!! Such a beautiful tablescape! I just love to eat outdoors, too. Cute dishes, so perfect with the checkered tablecloth and napkins. Your fresh vegies make such a nice centerpiece! Thanks for the recipe. I'm going to try it soon. Looks and sounds delicious. Pretty! Love the green, the dappled light under the pear tree, and the table settings themselves. Those tomatoes add a lot of natural "bling" to the table as it were. What a beautiful setting under the tree!!! And sounds like a great menu!!! Wow!! So pretty! 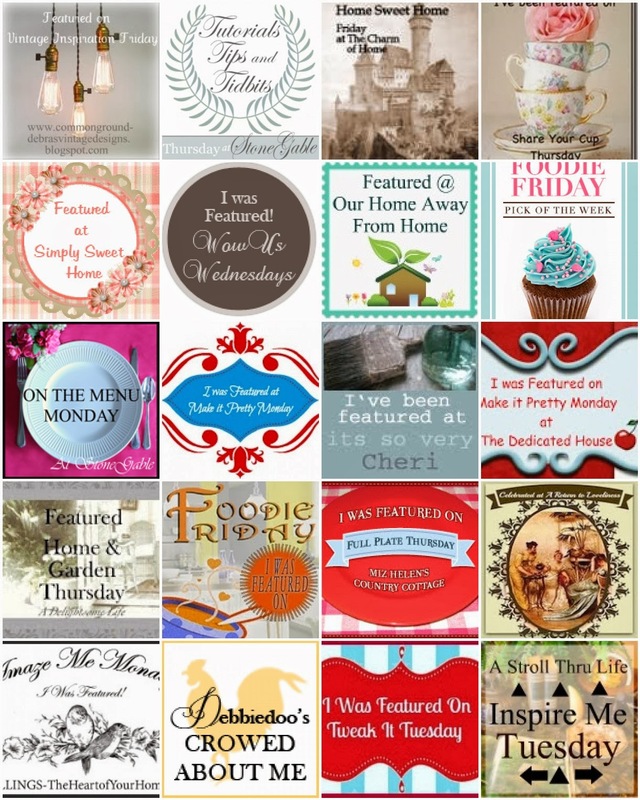 I would like to invite you to enter my HomeGoods 50 dollar gift card giveaway. The card can be used at TJ Maxx and Marshalls as well. What a charming tablescape...love the setting and those cute dishes. What a beautiful tables cape. Love those dishes! Your tablescape is absolutely delightful in your beautiful yard. So many charming details and accessories. Looks so inviting! Absolutely lovely! Even the title is sooo charming (it's what led me here) Those bell peppers are quite expensive in my part of our beautiful planet. I'm so glad I got to see such pretty pictures; they're my kind of pictures. Thanks for sharing them. I followed you on Linky. Oh I want to dive into the picture and enjoy the feast! Not only the food but the beautiful tablescape! I love it all...the darling dishes, the dishtowel napkins, the table linens and the grapevine wreath chargers!! Fantastic! Come link up to Centerpiece Wednesday and share this. Oh wow, what a lovely table and setting. I always love gingham and it is perfect for this table. Love all your cute lil veggie plates too, they are perfect as well. All your veggies look wonderful. Just a delightful table! Oh this tablescape is so pretty, fun and fresh looking! there is nothing better than decorating a table with Mother nature's bounty! Visiting from Let's Dish! Yum that looks so good,wish I had a hugh bowl right now..your outdoor tablescape is fantastic,so pretty under the ole pear tree,so peaceful and relaxing. Those tomatoes look amazing. I didn't get out to the farmer's market this year, so I'm envious. First of all, you have a pretty yard. And of courese, we all love the fresh tomatoes. With a little flavored balsamic vinegar . . . . heaven. You table is cozy and lovely, love the tasseld fringed napkins. Eating outdoors, homegrown food, heaven. Love the lighting in the first photo! I just love to eat outdoors too. Those dishes are just toooo cute. I just printed the gazpacho recipe, and I'll size it down to make it just for me. The rest of the family will request minestrone :-) Visiting from Let's Dish. I absolutely love it that you brought the garden to your table. Your whole table looks good enough to eat!!! :-) You must have put a hit out on garden pests because your bounty is flawless! I love the Tuesday Morning plates!!! So cute, and perfect for this setting!!! I like the green and white on the table, too. Very clever to fashion that topper out of a duvet cover! I wish I could sew like that! Very nice! Enjoy your weekend and what's left of your garden! O, this is just beautiful. Your table is stunning and so summery...I love it. Your tree and lawn look amazing. you have inspired me to do one or two more quick tablescapes outside, while our grass is still a tad green. The salad plates were perfect for this delightful table, lots of my favorite green, too! Your beautiful tomatoes make the perfect centerpiece. I love everything about your post! Hard to believe summer is coming to an end even though we had a good one. What a lovely post,everything is so fresh and beautiful.I covet your gingham tablecloth etc. I have quite a collection in many different colours and I love to put them all out on the line together to dance in the breeze. Your whole post is so inspiring.Thank you. This so pretty! Nice and crisp! Love those plates, just darling! It would be wonderful to have lunch in your yard at this inviting table!